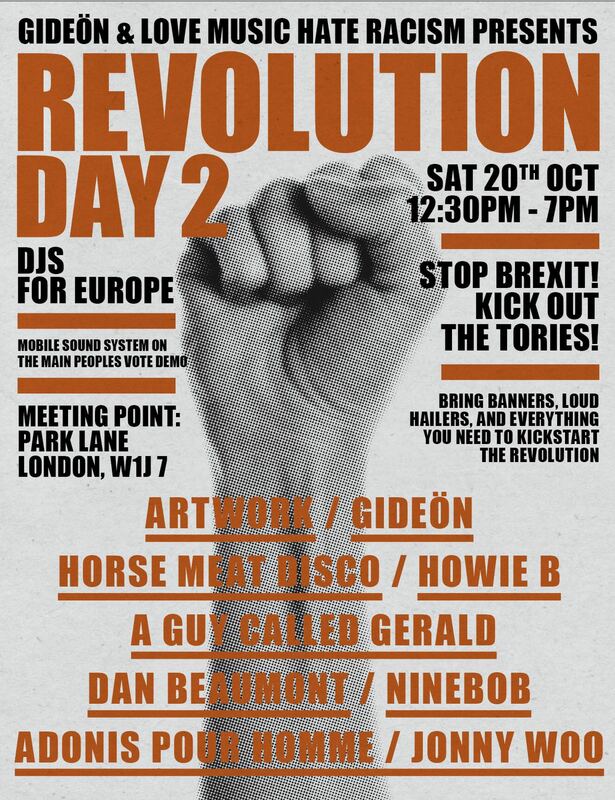 This Saturday, numerous DJs — including Artwork, Horse Meat Disco and Gideön — will be performing on a mobile soundsystem to protest against Brexit. Like many industries, a potential no deal could have a disastrous effect on the dance music industry which sees DJs crisscrossing Europe thanks to the friction-free movement of European residents. It’s been argued that Brexit will stop touring DJs from touring with ease and will be a massive headache of bookers, clubs and festivals when it comes to getting DJs in and out of countries quickly to perform at multiple events, often on the same day. The soundsystem will be part of a huge pro-EU march which is set to take place on Saturday 20th October in central London, with the soundsystem running from 12:30 pm to 7:30 pm. This protest, Revolution Day 2, comes after the same collective of DJs – gathered by Gideön – ran a similar soundsystem during the Anti-Trump march this summer. As well as impacting touring musician and DJs, it’s been suggested that services like Spotify and Netflix might be blocked unless a deal can be struck between the EU and the UK government. Details of the pro-EU mobile soundsystem can be found here.